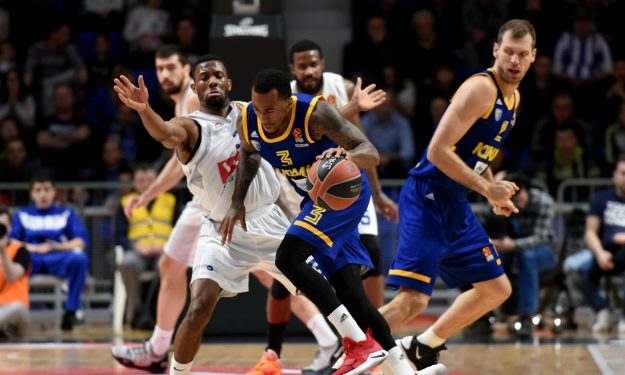 In a dramatic finale in Podgorica, Khimki Moscow survived and defeated Buducnost. Thanks to Stefan Markovic’s three-pointer in the final minute, and Jordan Mickey’s incredible performance, Khimki Moscow Region escaped from Podgorica with a tight win, after defeating Buducnost VOLI, 90-98. Khimki currently sits in the 12th spot with 9-13 record, and is still in the fight for a playoff spot. With three minutes remaining, the game was all tied at 80. Norris Cole scored an important three-pointer, and Goga Bitadze put up four points to put the hosts up by two points (87-85). Jordan Mickey, on the other hand, also made huge buckets and free-throws down the stretch and tied the game yet again at 87 with a minute remaining. With 48 seconds on the clock, Markovic came up big and knocked down the most important shot of the contest (88-90). Mickey scored yet another basket, and since that point, the game was over. Mickey, had a phenomenal game for the visiting team. He was one-point shy of his career high, as he put up 25 points (7/9 2FG) and four rebounds. Besides, he also came up big in the final minutes of regulation. Jenkins added 17 points. For Jasmin Repesa’s squad, former NBA champion, Cole, finished with a double-double of 20 points and 11 assists, while 19-year old prodigy, Bitadze, put up 17 points and seven rebounds. The game was competitive in the first half, as both teams were playing great basketball, showcasing their offense. After 20′, the hosts had a one-point lead (46-45) in what was a high-scoring half. Bitadze and Charles Jenkins were leading the way for the two teams. Thanks to Jenkins’ offensive crescendo in the final minutes of the third period, Khimki went up ahead and had a three-point advantage to start the fourth-quarter (65-58).